Background and Objective: To determine the prevalence of chronic kidney disease (CKD) and incidence of acute kidney injury (AKI) in patients with coronary artery disease (CAD) demonstrated on coronary angiography. Materials and Methods: Totally, 125 patients admitted to Lilavati Hospital and Research Centre, Mumbai, with CAD were included in the study. Results: Left anterior descending artery was the major vessel involved (40%), followed by a circumflex artery (21.6%). 49 out of 125 (39.2%) were found to have underlying CKD. 69% (34) of these CKD patients developed AKI. 21 out of 34 patients who developed AKI required hemodialysis. Only 47.1% (16 out of 34) of CKD patients had complete recovery, 29% had partial recovery, and 23% had no recovery of their renal function from AKI. Statistically significant number of patients in CKD group had no recovery from AKI as compared to non-CKD group (23.5% vs. 0%). Conclusion: Our study concludes that there is a very high prevalence of CKD (39.2%) in patients with CAD and AKI is a very important complication (38.4%) in these patients. Considering such a high prevalence of CKD, nephrology referral must be considered in patients with abnormal urinalysis, spot urinary protein to creatinine ratio and in patients whose creatinine clearance is <60 ml/min. Chronic kidney disease (CKD) is a worldwide public health problem. CKD occurs commonly in patients with cardiovascular disease (CVD). CKD is a major and serious risk factor for coronary artery disease (CAD). CAD is extremely common in the population of uremic patients. In people with established CAD, CKD predicts recurrent events as strongly as other established cardiovascular risk factors such as diabetes and elevated blood pressure. Whether the cardiovascular risk in the setting of CKD is due to increased atherosclerotic burden, higher risk of plaque rupture as a result of inflammation,  or other mechanisms is unknown. Acute kidney injury (AKI) is a common and serious complication in patients with CAD, who undergo coronary angiography (CAG). Although the incidence of AKI requiring dialysis is low, the presence of even small changes in kidney function has been associated with adverse short-term outcomes, including target vessel reocclusion, prolonged hospital stay, and in-hospital mortality. The long-term clinical consequences of AKI in this setting are less clear. Our study aims to determine prevalence of CKD in patients with CAD demonstrated on CAG, to determine how many went on to develop AKI; amongst those who developed AKI how many had complete recovery, partial recovery, and no recovery of renal function. Serum creatinine levels were measured at the end of 3 months in those patients, who developed AKI, to find out how many had complete recovery, partial recovery and no recovery of their renal function. The Statistical software namely SPSS 15.0 was used for the analysis of the data and Microsoft word and Excel have been used to generate graphs, tables, etc. Chi-square/Fisher exact test has been used to find the significance of study parameters on the categorical scale between two or more groups. Totally, 125 patients with angiography proven CAD were included in the study. 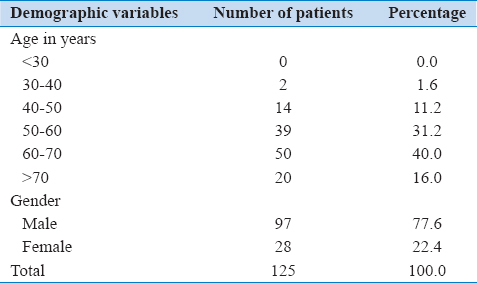 Majority of patients (40%) belong to 60-70 years age group [Table 1]. Among 125 patients, 77.6% were found to be males and 22.4% were found to be females [Table 1]. Hypertension was found to be the more prevalent (66.4%) co-morbid condition associated with CAD, followed by diabetes mellitus (50.4%). Left anterior descending was the major vessel involved (40%), followed by a circumflex artery (21.6%). Majority of the patients had single-vessel disease (79.2%), followed by triple vessel disease (15.2%) and double vessel disease (5.6%) being the least common. Fifty-five percent of patients had <0.2 g proteinuria/day on spot urine for protein to creatinine ratio estimation, 22.4% had proteinuria in the range of 0.2-1 g/day, 10.4% between 1 and 2 g/day, 9.6% between 2 and 3 g/day, and 2.4% had proteinuria of >3 g/day. 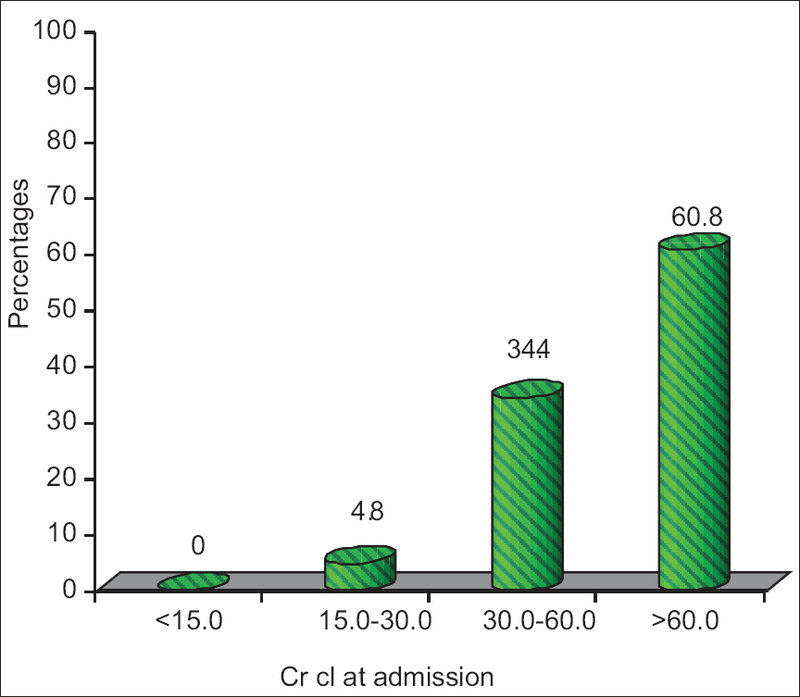 Approximately 40% of patients had stage III CKD during admission [Figure 1]. AKI developed in 38.4% of patients. 69% of these had underlying CKD [Table 2]. Approximately 55% of patients who developed AKI required renal replacement therapy in the form of hemodialysis (HD). 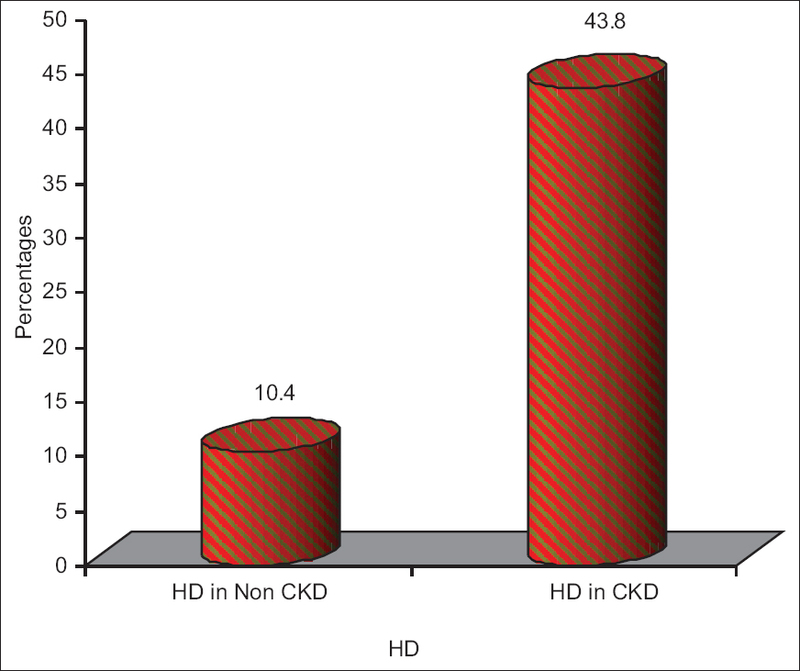 Among 55%, significant number of patients requiring HD belongs to CKD group (43.8%) [Figure 2]. 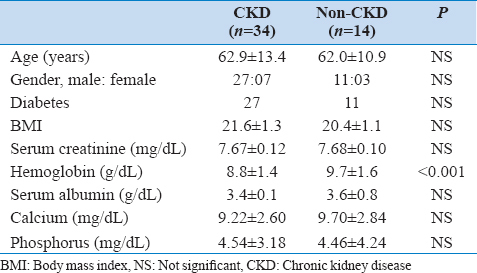 Contrast-induced nephropathy (CIN) preventive measures in the form of hydration using normal saline or N-acetyl cysteine or sodium bicarbonate were used in 46.9% of CKD patients [Table 3]. Statistically significant number of patients developed AKI in the CKD group, which did not receive any CIN preventive measures (P < 0.001). Statistically significant correlation was found between low hemoglobin levels and development of AKI in CKD group [Table 4]. There was no significant difference with respect to age, gender, body mass index, duration of diabetes and levels of serum creatinine, serum calcium and serum phosphorus levels between patients with and without CKD in development of AKI. Creatinine clearance at the end of 3 months was measured in those patients who developed AKI during their coronary evaluation. Majority of patients were found to have a creatinine clearance in the range of 15-30 ml/min (33.3%), followed by 30-60 ml/min (31.3%), >60 ml/min (25%) and <15 ml/min (10.4%). Recovery of renal function at the end of 3 months in CKD and non-CKD groups is shown in [Table 5]. We found that the prevalence of CKD among 125 subjects with CAD was 39.2%. Liu et al. in their study found that the prevalence of CKD among the 3513 China Heart Survey (CHS) participants with coronary heart disease was 24.8%. Mielniczuk et al. in their study, estimated baseline eGFR for the 4181 patients with non-ST or ST elevation acute coronary syndromes who participated in the Aggrastat-to-Zocor Trial. The baseline eGFR in their study was 67.8 ml/min/1.73 m 2 (range, 9.7-149.2 ml/min/1.73 m 2 ) indicating that a significant number of patients had underlying CKD. In our study, 48 patients (38.4%) out of 125 developed AKI (defined as an increase in serum creatinine levels ≥1.5 × baseline). Of 48 patients who developed AKI, 34 of them had underlying CKD. 54.2% (26 out of 48) of these AKI patients required renal replacement therapy in the form of HD. Requirement of HD was more in patients with underlying CKD (21 vs. 5) as compared to non-CKD patients. Parikh et al. performed an observational study of 147,007 elderly Medicare patients admitted for acute myocardial infarction (AMI) as a part of the cooperative cardiovascular project. They evaluated the association between AKI and all-cause mortality in the above-mentioned population. In their study, 19.4% of the patients had AKI. Goldberg et al. studied the incidence and clinical significance of transient versus persistent AKI in 1957 patients who survived an ST-elevation AMI. AKI developed in 46.7% of the patients, of these 3.9% (10) patients received renal replacement therapy. We followed-up 48 patients, who developed AKI to find out how many had complete recovery, partial recovery, and no recovery of AKI at the end of 3 months. 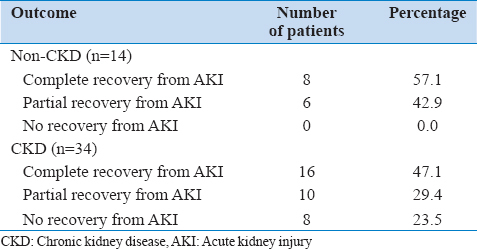 Of 14 non-CKD patients who developed AKI, 8 (57.1%) patients had complete recovery and 6 (42.9%) had partial recovery of AKI. Of 34 CKD patients, 16 (47.1%) had complete recovery, 10 (29.4%) had partial recovery, and 8 (23.5%) had no recovery of AKI. Statistically significant number of patients developed no recovery of their renal function in CKD group (23.5% vs. 0) as compared to non-CKD (P < 0.001). These patients became dialysis dependents. Finally, we did not address the influence of different therapies that were administered during the acute phase of the CAD on the changes in renal function. All patients should have their renal function assessed 3 months after the CAG. National Institutes of Health, National Institute of Diabetes and Digestive and Kidney Diseases. US Renal Data System, USRDS 1998 Annual Data Report. Bethesda, MD: National Institutes of Health, National Institute of Diabetes and Digestive and Kidney Diseases; 1998. Weiner DE, Tighiouart H, Stark PC, Amin MG, MacLeod B, Griffith JL, et al. Kidney disease as a risk factor for recurrent cardiovascular disease and mortality. Am J Kidney Dis 2004;44:198-206. Wolfe RA, Port FK, Webb RL, Bloembergen WE, Hirth R, Young EW, et al. Excerpts from the United States Renal Data System, 1998. Annual data report: V. Patient mortality and survival. Am J Kidney Dis 1998;32:S269-80. Nakano T, Ninomiya T, Sumiyoshi S, Fujii H, Doi Y, Hirakata H, et al. Association of kidney function with coronary atherosclerosis and calcification in autopsy samples from Japanese elders: The Hisayama study. Am J Kidney Dis 2010;55:21-30. Chonchol M, Whittle J, Desbien A, Orner MB, Petersen LA, Kressin NR. Chronic kidney disease is associated with angiographic coronary artery disease. Am J Nephrol 2008;28:354-60. Ix JH, Shlipak MG, Liu HH, Schiller NB, Whooley MA. Association between renal insufficiency and inducible ischemia in patients with coronary artery disease: The heart and soul study. J Am Soc Nephrol 2003;14:3233-8. Marwick TH, Steinmuller DR, Underwood DA, Hobbs RE, Go RT, Swift C, et al. Ineffectiveness of dipyridamole SPECT thallium imaging as a screening technique for coronary artery disease in patients with end-stage renal failure. Transplantation 1990;49:100-3. Joki N, Hase H, Nakamura R, Yamaguchi T. Onset of coronary artery disease prior to initiation of haemodialysis in patients with end-stage renal disease. Nephrol Dial Transplant 1997;12:718-23. Ohtake T, Kobayashi S, Moriya H, Negishi K, Okamoto K, Maesato K, et al. High prevalence of occult coronary artery stenosis in patients with chronic kidney disease at the initiation of renal replacement therapy: An angiographic examination. J Am Soc Nephrol 2005;16:1141-8.
deFilippi C, Wasserman S, Rosanio S, Tiblier E, Sperger H, Tocchi M, et al. Cardiac troponin T and C-reactive protein for predicting prognosis, coronary atherosclerosis, and cardiomyopathy in patients undergoing long-term hemodialysis. JAMA 2003;290:353-9. Gibson CM, Pinto DS, Murphy SA, Morrow DA, Hobbach HP, Wiviott SD, et al. Association of creatinine and creatinine clearance on presentation in acute myocardial infarction with subsequent mortality. J Am Coll Cardiol 2003;42:1535-43. Anavekar NS, McMurray JJ, Velazquez EJ, Solomon SD, Kober L, Rouleau JL, et al. Relation between renal dysfunction and cardiovascular outcomes after myocardial infarction. N Engl J Med 2004;351:1285-95. Weiner DE, Tighiouart H, Elsayed EF, Griffith JL, Salem DN, Levey AS, et al. The Framingham predictive instrument in chronic kidney disease. J Am Coll Cardiol 2007;50:217-24. James MT, Ghali WA, Knudtson ML, Ravani P, Tonelli M, Faris P, et al. Associations between acute kidney injury and cardiovascular and renal outcomes after coronary angiography. Circulation 2011;123:409-16. K/DOQI clinical practice guidelines for chronic kidney disease: Evaluation, classification, and stratification. Kidney Disease Outcome Quality Initiative. Am J Kidney Dis 2002;39:S1-246. Bellomo R, Ronco C, Kellum JA, Mehta RL, Palevsky P, Acute Dialysis Quality Initiative Workgroup. Acute renal failure - Definition, outcome measures, animal models, fluid therapy and information technology needs: The Second International Consensus Conference of the Acute Dialysis Quality Initiative (ADQI) Group. Crit Care 2004;8:R204-12. Gupta R, Birnbaum Y, Uretsky BF. The renal patient with coronary artery disease: Current concepts and dilemmas. J Am Coll Cardiol 2004;44:1343-53. Liu H, Yu J, Chen F, Li J, Hu D. Inpatients with coronary heart disease have a high prevalence of chronic kidney disease based on estimated glomerular filtration rate (eGFR) in China. Heart Vessels 2007;22:223-8. Mielniczuk LM, Pfeffer MA, Lewis EF, Blazing MA, de Lemos JA, Mohanavelu S, et al. Acute decline in renal function, inflammation, and cardiovascular risk after an acute coronary syndrome. Clin J Am Soc Nephrol 2009;4:1811-7. Parikh CR, Coca SG, Wang Y, Masoudi FA, Krumholz HM. Long-term prognosis of acute kidney injury after acute myocardial infarction. Arch Intern Med 2008;168:987-95. Goldberg A, Kogan E, Hammerman H, Markiewicz W, Aronson D. The impact of transient and persistent acute kidney injury on long-term outcomes after acute myocardial infarction. Kidney Int 2009;76:900-6.